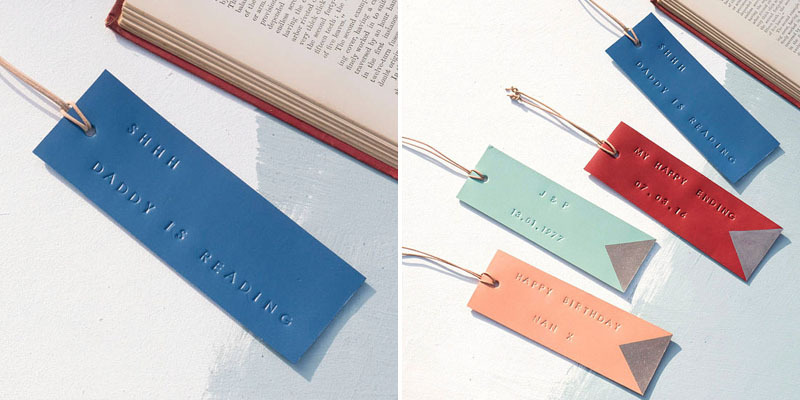 Whether you’re voraciously reading New York Times Bestsellers, keeping tabs on the latest business trends or perusing the pages of the classics, there’s one thing every bibliophile needs: A bookmark that’s just as amazing as the books being read. Sure, you could use a receipt from today’s lunch, an envelope from the bill you just opened or even a magazine renewal postcard to mark the pages. But why? That’s so boring! 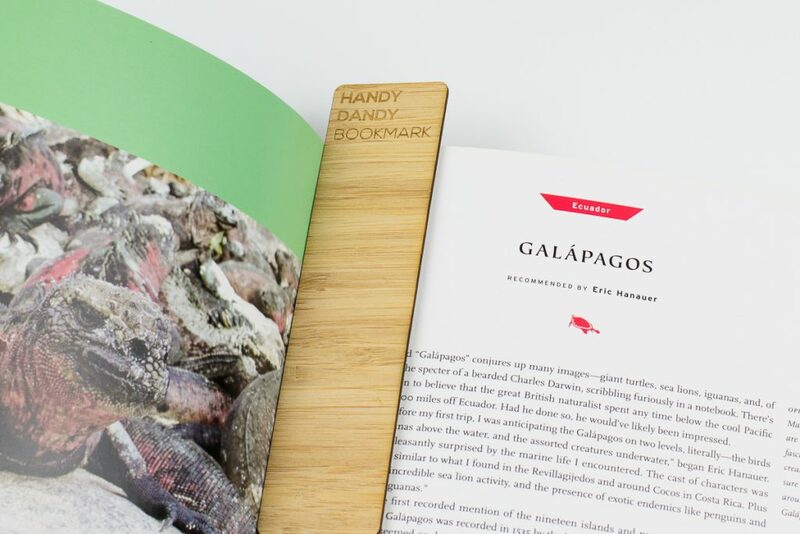 Why not have bookmarks that are just as original as the books you—or your customers—choose to read! In this article, we’ll look at how to make a bookmark for a book and give lots of creative inspiration on crafting personalized bookmarks to use yourself, give to friends and family, sell online or even use promotionally to build your brand. With all the bookmark designs available, where do you start on your bookmark making journey? A good brainstorming session is a great place to begin, as this allows you to figure out what you like (and don’t), determine what is already on the market and identify any gaps that could be filled with your creativity. 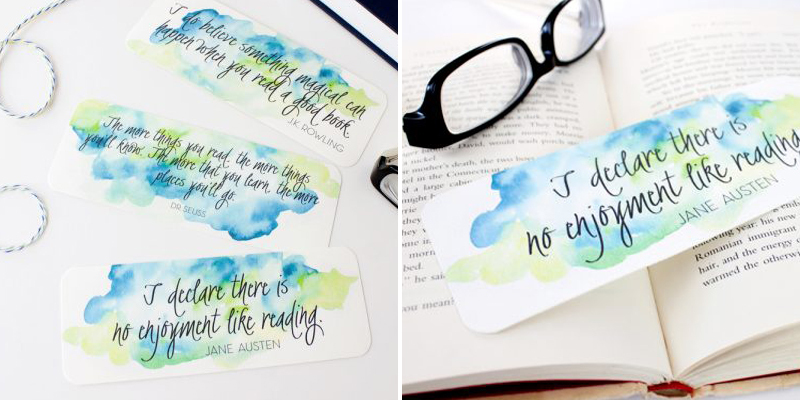 Perhaps you’re drawn to a thick, art-paper style like these watercolor bookmarks featuring quotes from Jane Austen, Dr. Seuss and JK Rowling. If so, you’re in luck. Get the printables from Remodelaholic. Or maybe tech is your thing. 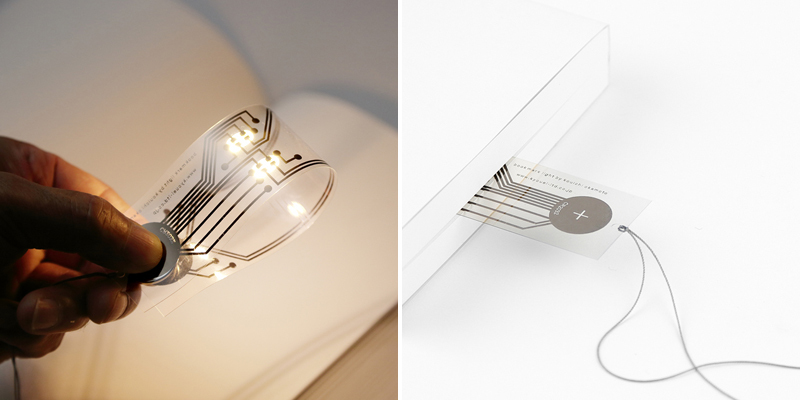 Illuminate some inspiration with this bookmark light that is printed on a special film using ink that transmits electricity. Design Boom has the details. Or maybe you’d like to make bookmarks with dimension—and humor. 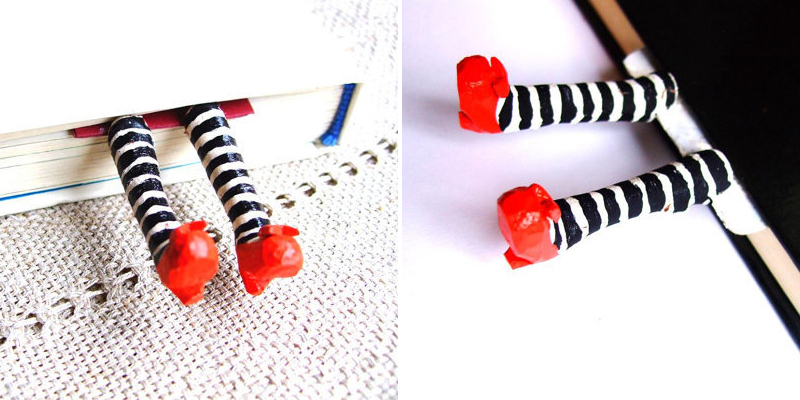 Etsy seller bloomyjewelry was inspired by The Wizard Of Oz to create this Wicked Witch of the East bookmark from polymer clay that was decorated with acrylic paint, then varnished and attached to a cardboard base. Very clever! How can you find inspiration from characters in your favorite books to create a design of your own? For even more inspiration, check out these bookmark ideas at Bored Panda and Huff Post. You can also find some really unusual ones on Trend Hunter. If you’re a fan of the zombie apocalypse, then don’t miss #14. Audience: Who will be using the bookmarks? Are you making for yourself, to give as gifts, to sell for profit or to use promotionally to build your brand? Materials: What materials do you want to use? New vs. recycled? Are you comfortable using these materials or are you learning new techniques? Quantity: Are you making a single bookmark or multiples? Time: How complex is your design, and how much time will it take to complete? Budget: How much do you want to spend? At this point, grab a pencil and paper or open up your go-to design program. It’s time to get the ideas going. This tutorial via Instructables shows how to make bookmarks using Photoshop. But don’t worry if your design skills are more novice than pro. There are user-friendly sites such as Canva that use drag-and-drop technology + a variety of templates to make designing bookmarks a breeze. Now that you have some ideas for making unique bookmarks, it’s time to start having some fun! Let’s look at the variety of bookmark materials you can use: Paper, felt, fabric, yarn, leather, wood and metal as well as some specific styles of craft bookmarks including corner, tassel and paper clip. Cardstock is of the most widely available and easiest materials for making bookmarks. Paper can easily be printed on a home printer, cut with scissors, embossed or laminated to make bookmarks of any size, shape and design. There are also all kinds of free printables available online to make bookmarks. All ya do is download the art file, print it out and finish it to your liking. These examples (left to right) from Frugality Gal, College Life Made Easy and Or So She Says will get you started. If you have larger orders (especially if you plan to sell your bookmarks or use them promotionally to build a brand), you can design your own and have them printed and cut with commercial companies to ensure consistency and a professional finish. Here’s a paper bookmark idea that doesn’t involve printing: Use paint chips as the foundation, then cut and draw to your heart’s content. If you love cats (we do! 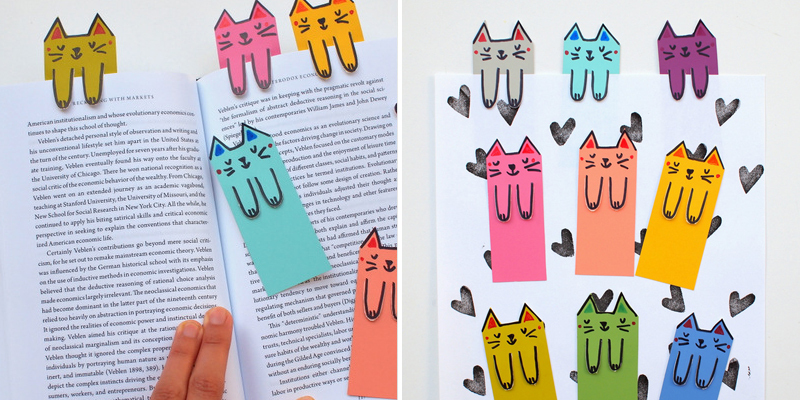 ), then stop by DIY Candy for the tutorial of these kitty bookmarks. Sometimes you need to mark multiple pages in a book or magazine, such as when researching a term paper or flagging favorite recipes in a cookbook. Sure you could use regular ol’ Post-it® Notes. But designer Duncan Shotton has a better idea: Sticky Page Markers that are a collection of natural environments as well as renowned cities. See his ideas at Design Boom and get inspired to make your own. 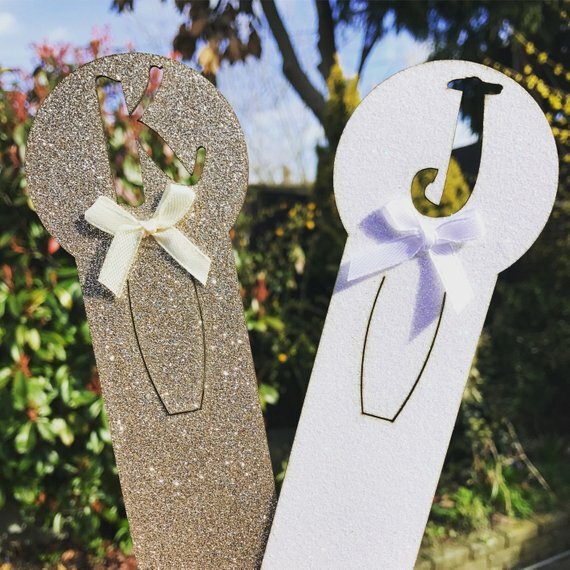 Using specialty paper, such as this glitter cardstock, Etsy seller Asharedesigns was able to design and make bookmarks that are unique and further customized with any letter from the alphabet. The gold and white make great wedding favors, but you could do holiday-themed colors (red and pink for Valentine’s Day, green for St. Patrick’s Day, orange and black for Halloween, etc.) and sell them as teacher gifts or party favors. For more ideas on how to make a simple bookmark with paper, check out these origami bookmarks as well as these paper craft ideas. If you’re looking for an easy way to make bookmarks beyond the conventional rectangle, then corner bookmarks are a great place to start. 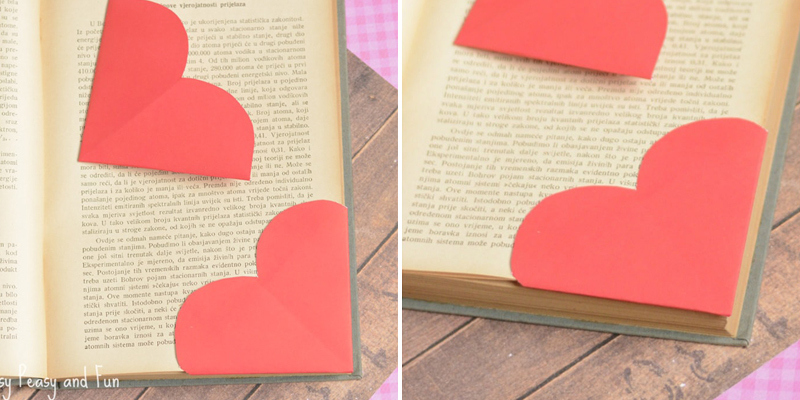 These simple heart corner bookmarks only require some pretty paper and scissors to make. Follow this tutorial at Easy Peasy And Fun to make your own in minutes. And if you’re looking for tons of corner bookmark designs, check out this post at Red Ted Art that has links to 50+ ideas. Wow! For easy-to-follow instructions on how to make corner bookmarks, check out this Emoji corner bookmarks video. 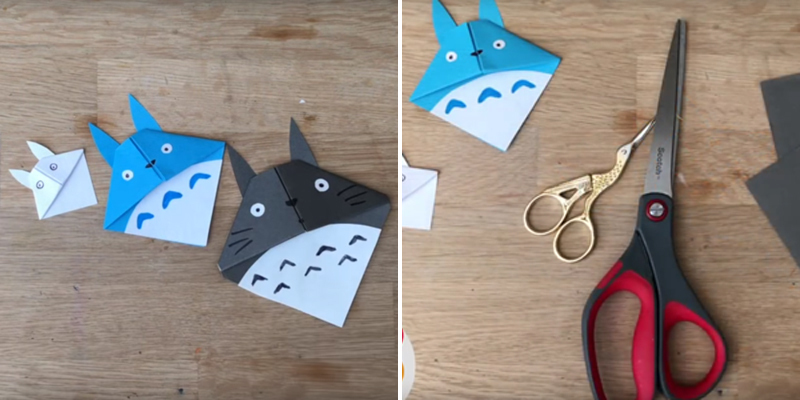 There’s also a tutorial to make these Totoro bookmarks. Watch it here. While corner bookmarks are traditionally made from paper as seen above, they can also be crafted from felt. Check out this tutorial via Makezine to learn how. 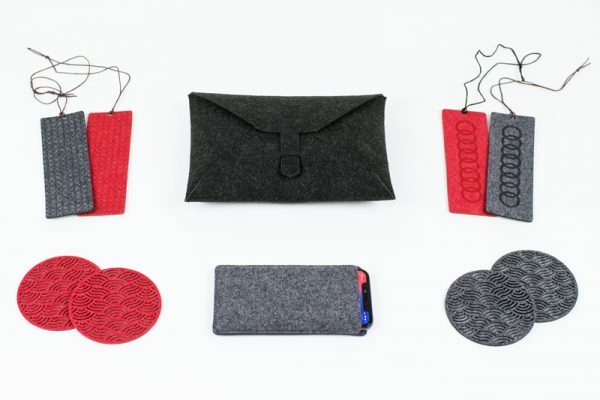 Felt is a soft material that is easily workable. Cut it with scissors or a utility knife, sew it into cool shapes or even laser cut it (this is a great option if you’re making a larger quantity and want consistency, especially if you’re selling them). Since felt often has a wool base, it’s more substantial and has some rigidity when compared to traditional fabric, but it still remains soft and flexible. And it often comes in bright, eye-catching colors for added interest. As mentioned above, felt is great for making corner bookmarks that have more substance. 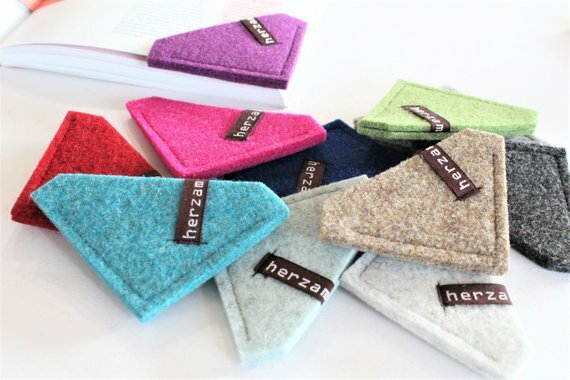 These from Etsy seller herazmstiel are made from 3mm wool felt in 10 colors. She even adds a logoed tag for a little brand building of her own. 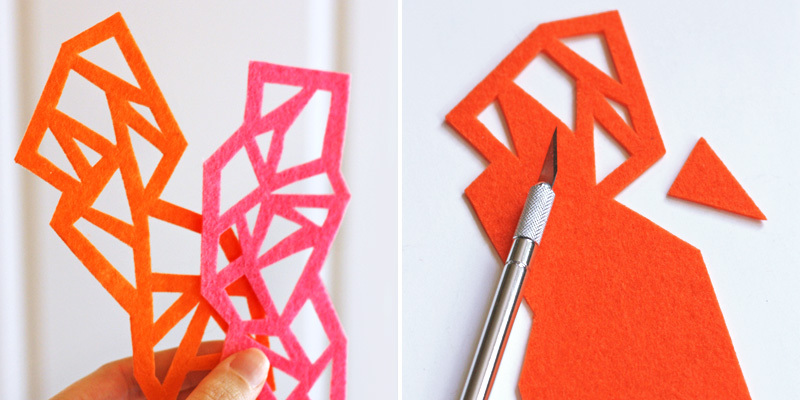 For a more classic flat bookmark, these geometric felt bookmarks from How About Orange are anything but traditional. While this kind of stained-glass-inspired design can be cut by hand, the geometric shapes lend themselves to the precision of laser cutting—which saves tons of time and ensures consistency if you’re make quantity to sell. This concept could even be morphed into a design that incorporate a logo to make bookmarks than can be used as promotional products. 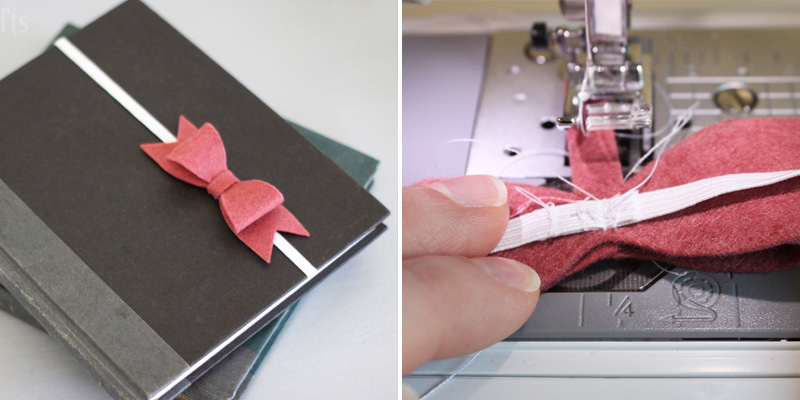 These cute ribbon bookmarks combine felt with elastic to tame the pages. While these were made with a die cutting machine, you could easily hand cut or have them precision laser cut. Get the tutorial at Cutesy Crafts. What’s great about fabric bookmarks is that the patterns and colors available are nearly limitless. From timeless and traditional to wild and whimsical, there’s a print for everyone and every occasion. If you already do some sewing of your own, then you no doubt have fabric scraps lying around. Perfect to make bookmarks! You can also find remnants at fabric stores on the cheap. And what about your own closet? There are probably some pieces that you love the pattern but the cut is outdated or the garment simply no longer fits. Recycle that blouse, skirt or denim into a stunning set of bookmarks that are unlike any others on the market. 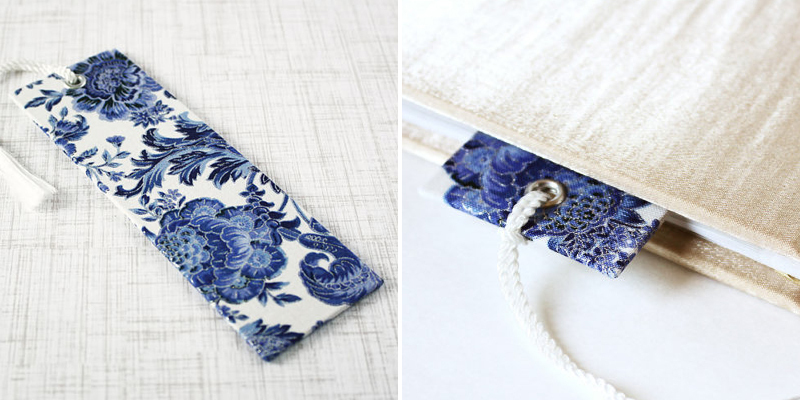 For inspiration, look no further than these fabric bookmarks from Etsy seller LonettaAvelarDesigns. She has taken premium cotton fabric and added an acid-free chipboard insert to give the bookmark just the right amount of rigidity. It’s finished with a tassel threaded through a metal grommet at the top. To learn how to make bookmarks of your own using fabric, check out this tutorial via The Crafty Mummy to get started. If you love the look of fabric but want a bit less sewing, this ribbon bookmark is a super easy project. All you need is some pretty ribbon, fun buttons, hair elastics, needle and thread, and scissors. Get the step-by-step instructions from 5 Minutes For Mom. To make this bookmark style truly salesworthy, use premium ribbon and/or vintage buttons for a one-of-a-kind touch. You could even turn this idea into promotional products by using ribbon in corporate colors + a custom cabochon in the shape of a company logo. 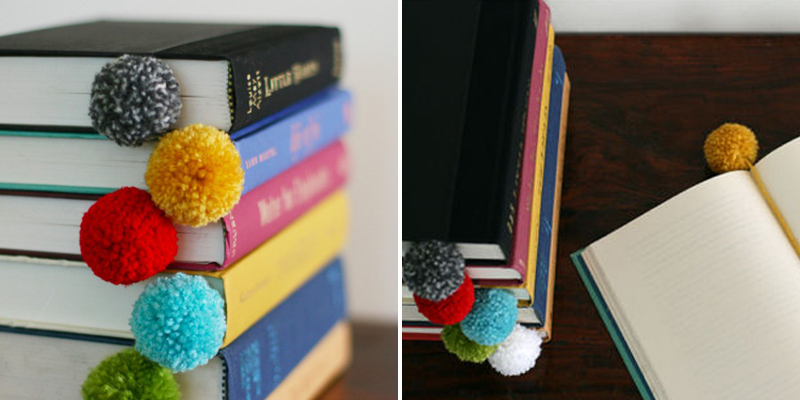 These pom pom bookmarks are super cute…and super easy to make. Use the tutorial from Design Mom and get to crafting gifts for teachers (just add your fave book) or favors for book club gatherings. You could even make these as a craft activity at a book-themed birthday party! These lace crochet bookmarks from Petals to Picots incorporate ribbon through the middle of the design. So pretty. Just think of all the color combinations that could be done! Get the tutorial here. 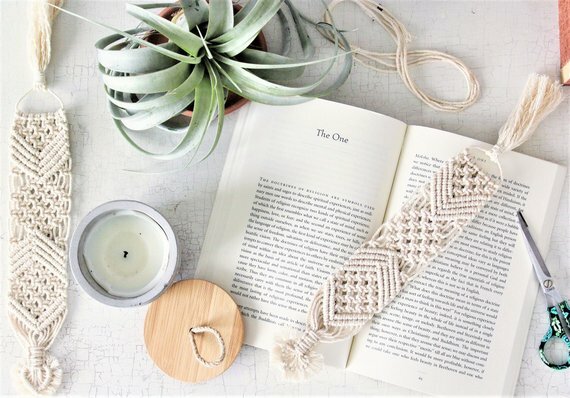 Handmade with 100% unbleached cotton rope, Etsy seller KnottyWoodStudio adds flair to these macramé bookmarks with a tassel on the top designed to stick out of the book as the place marker and a cute heart detail at the bottom. For additional interest, you could laser cut wood rings or cabochons to weave into the design. For even more inspiration, here are 10 ideas from The Spruce and another 20 crochet patterns from Creativities. We’re obsessed with the Mike Wazowski pattern! 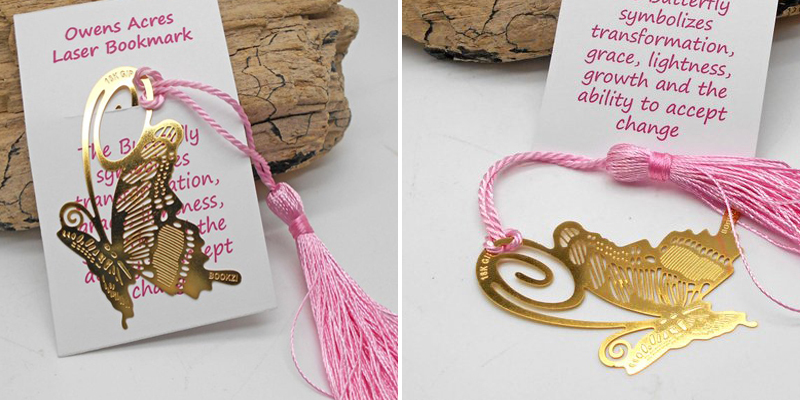 Tassels may seem like a simple decoration to spice up a bookmark. But they actually serve the important function of keeping the bookmark in place without it getting lost within the pages. Tassels come in all shapes and sizes, and they’re really easy to DIY. This tutorial on Wikihow walks you through how to make bookmarks with tassels with ease. 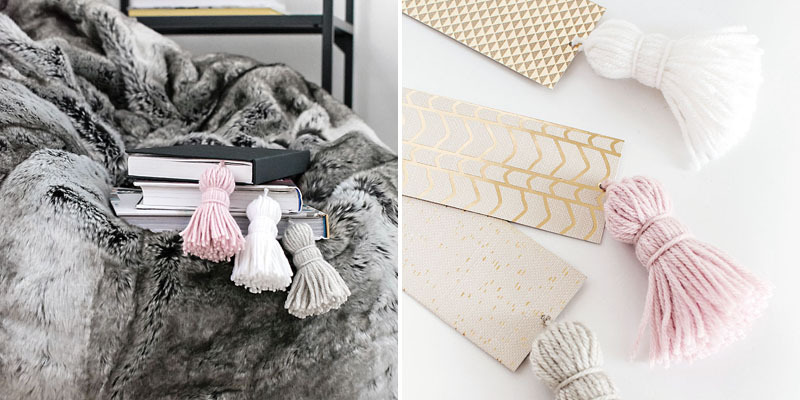 While the above tutorial is for an average-sized tassel, we’re really loving these chunky tassel bookmarks from Homey Oh My. The oversized scale is interesting—and eye catching especially when paired with geometric cardstock. 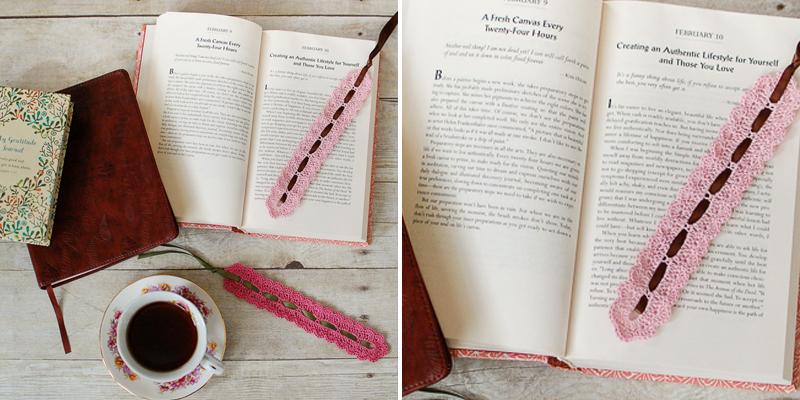 If you want to make custom bookmarks with tassels like these, here’s the tutorial. 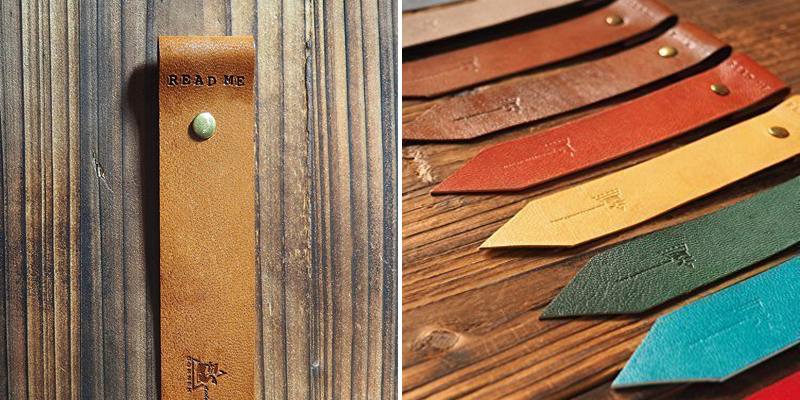 These personalized bookmarks from Etsy seller SwagAndTassel are hand-stamped with a personal message + a splash of metallic paint and are finished with a leather cord. The mint and peach colors are really unusual—and fun! Monotype needed some special swag to get the buzz going at a tradeshow for the new Quire Sans typeface. Since “quire” is a classical term for a signature of printed leaves, folded and ready for binding with other signatures into a book or manuscript, a bookmark was a natural fit. While Monotype could have done a paper bookmark, they decided to do something more tactile. More substantial. 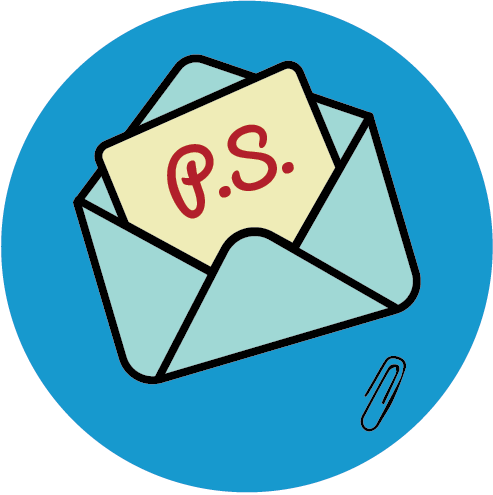 Get all the details on this bookmark (and how tradeshow attendees responded) here. 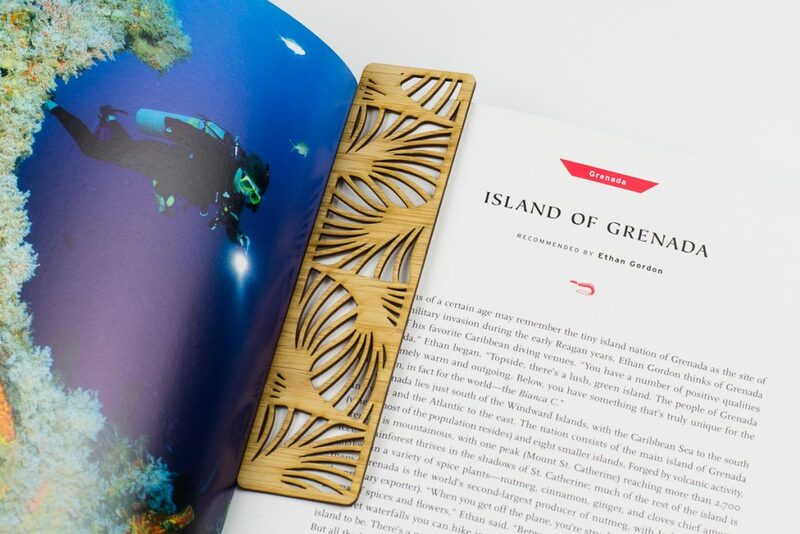 Wooden bookmarks have a natural yet premium appeal to them. Often sourced from sustainable forests then precision cut with tools such as lasers, they tick both for aesthetics as well as values for today’s consumers. Additionally, there’s something fitting about a tree-based bookmark for a tree-based book. 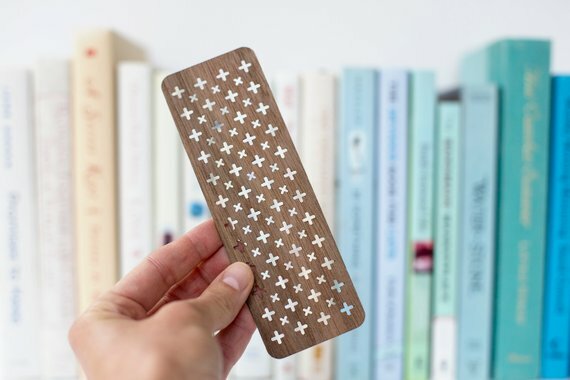 Laser cut from walnut veneer that’s about as thick as a postcard, Etsy seller BlueFoxEngraving uses a repeating “+” pattern to make bookmarks that are simple yet visually interesting. Here’s another example from BlueFoxEngraving. This time, a repeating chevron tile pattern gives this page-marker much sales potential. 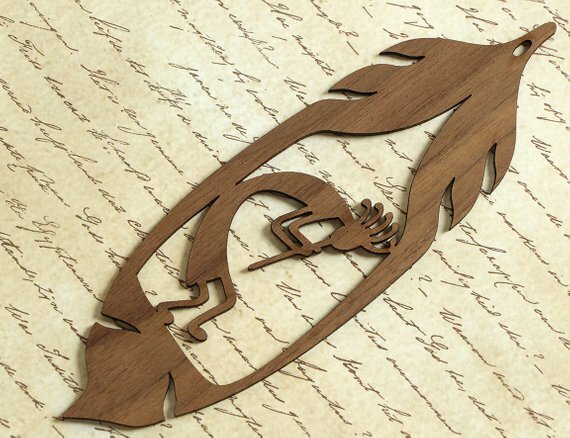 This laser cut solid wood bookmark from Etsy seller FinePenArt features the Kokopelli fertility deity as the centerpiece in a feather shaped bookmark. Since the protrusions from his head are often feathers, this design marries the symbolic elements in a beautifully stylized Southwestern theme. 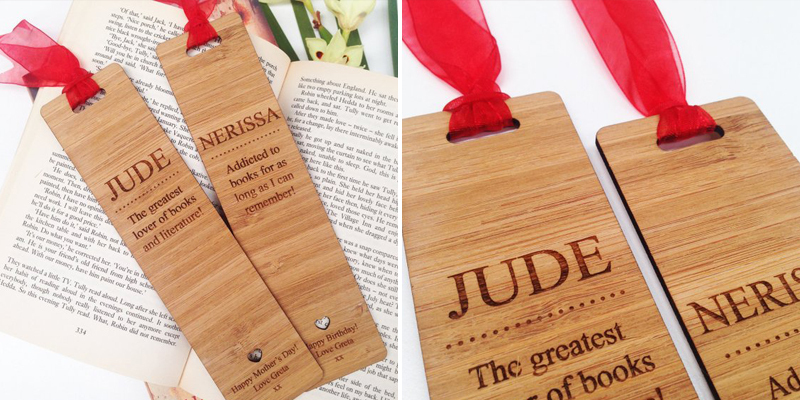 The wood grain shines in these bamboo bookmarks from Etsy seller ColourandSpice, who adds complete customization by laser engraving a name, phrase or quote, and who it’s from. 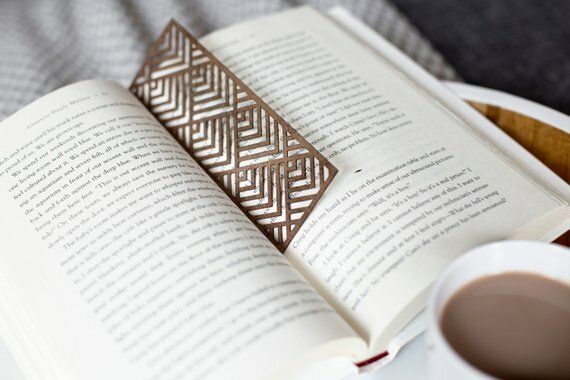 Etsy seller BelvedereCollections laser engraved a repeating chevron pattern into 2mm plywood to create these geometric bookmarks. He then personalizes them with a person’s name and adds twine as the finishing touch. Why sell one bookmark when you can sell a set! 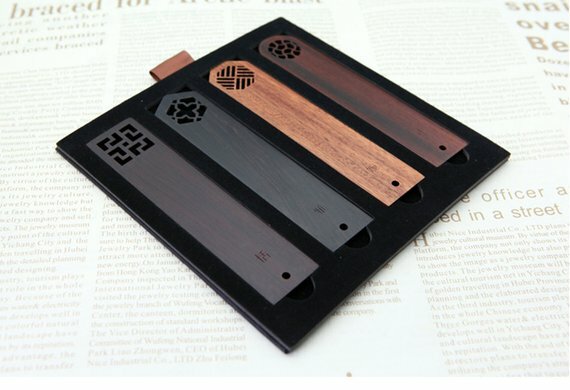 These laser cut rosewood bookmarks from Etsy seller WXWoodenStyleHome not only have four different wood finishes, but they also feature interesting geometric designs—square, hexagon, octagon and circle—that align with how the top of each bookmark is cut. “I like big books and I cannot lie!” Sing it in your best Sir Mix-a-Lot voice! 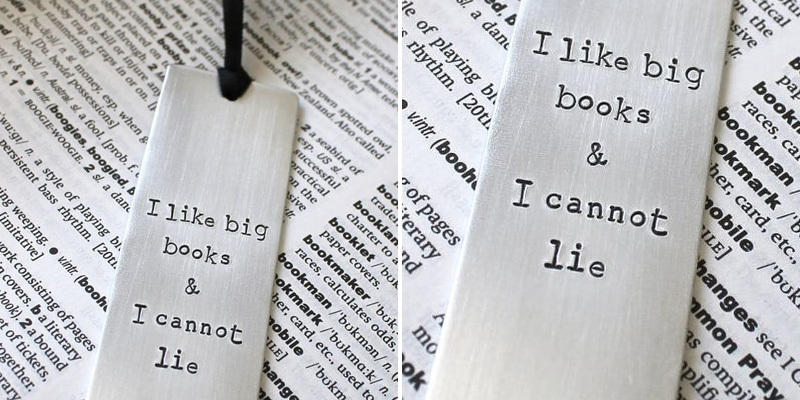 Impressions aside, we found these beauties on Pinterest, and while these metal bookmarks no longer available from the original Etsy seller, we just had to share because they’re AWESOME! If you want some inspiration for how other Etsy sellers have incorporated this fun saying into their offerings, click here. 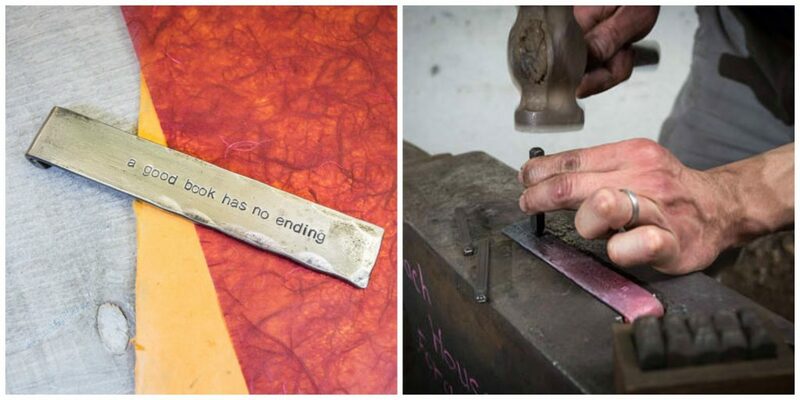 Etsy seller CoachHouseForge hand forges these iron bookmarks at the anvil, personalizes each via hand stamping, then finishes with a polished shine and seals with wax. We love the craftsmanship! Butterflies symbolize transformation, grace, lightness, growth and the ability to accept change. Etsy seller OwensAcres incorporates all of these qualities and more into these intricately laser cut 14kt gold plated bookmarks. 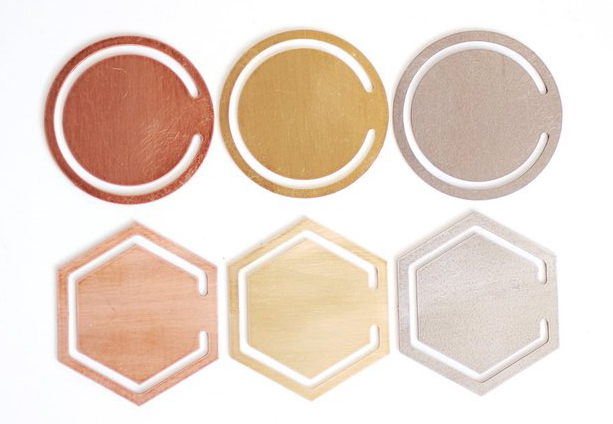 These minimalist geometric bookmarks from Etsy seller ShopRareBird turn simple cirles or hexagons into striking page holders through the use of laser cut copper, brass and steel. If metalsmithing seems too daunting of a task, there’s one really easy way you can work with metal without all the tools (and skill!). Enter the beloved paper clip. 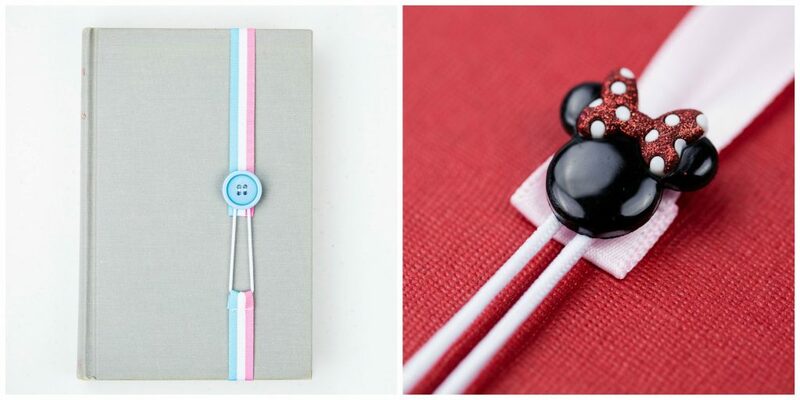 You can make bookmarks by bedazzling the simple paper clip with buttons, bows, laser cut cabochons…just about anything. 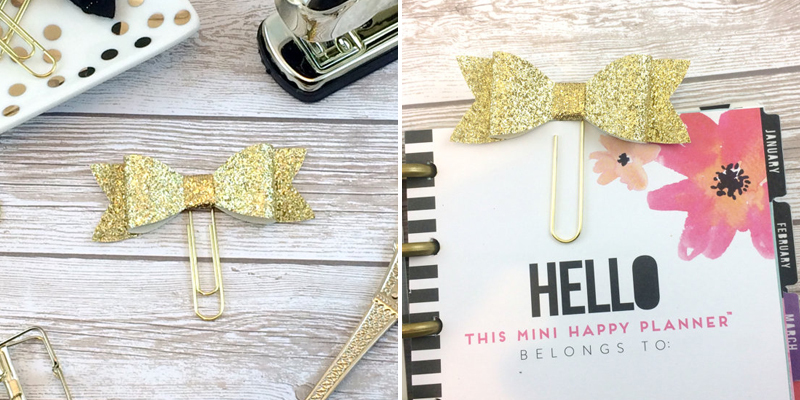 Check out these paper clip bookmarks from Etsy seller InspiredPeach where a pretty glitter bow was attached to a gold paper clip. Simply pretty! 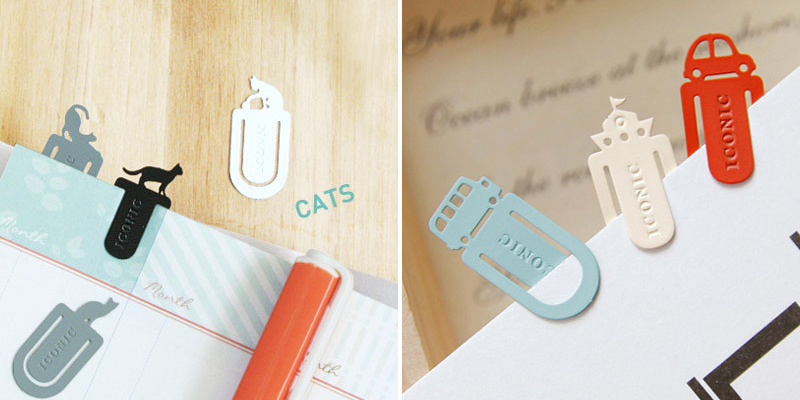 For more paper clip bookmark ideas, check out the “Help” bookmarks that were featured on Bored Panda. 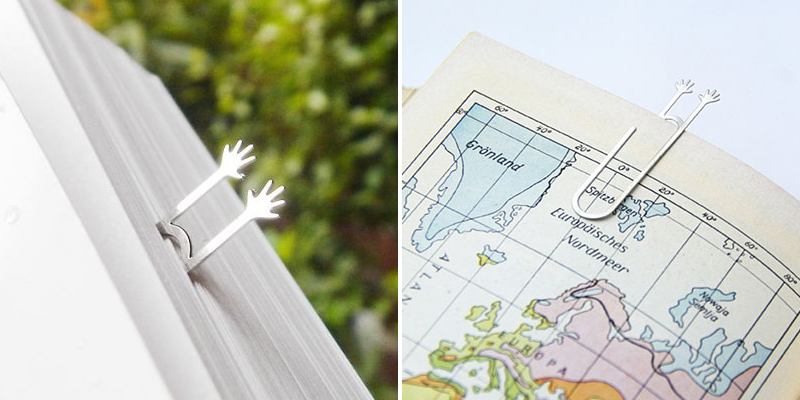 These machine-cut bookmarks use the natural shape of the paper clip to create outstretched hands. How could you use this design principle to create your own shape? Fallin Design used the paper clip style to create these sets of mini bookmarks. Clever way to make bookmarks unique while keeping the functionality of the paper clip! If you’re a maker who wants to profit from his or her creative passion, determining how to sell your products is a big decision. In the past, craft fairs and boutiques were the way to go. And they still can be. But today, most are selling crafts online. Why? Ninety-six percent of Americans shop online, according to this research. And they spend an average of $488 per year. Selling online will give you the largest audience, but how do you reach them? You could set up your own website, but having shopping capabilities with secure checkout can be complex and expensive. Plus, most creatives don’t want to be spending time on web development. They want to be making! That’s where online selling services come in. The most popular places to sell handmade goods online are Amazon, eBay and Etsy. But they’re not the only ones. This list on Small Biz Trends has 25 more places to sell handmade crafts online. 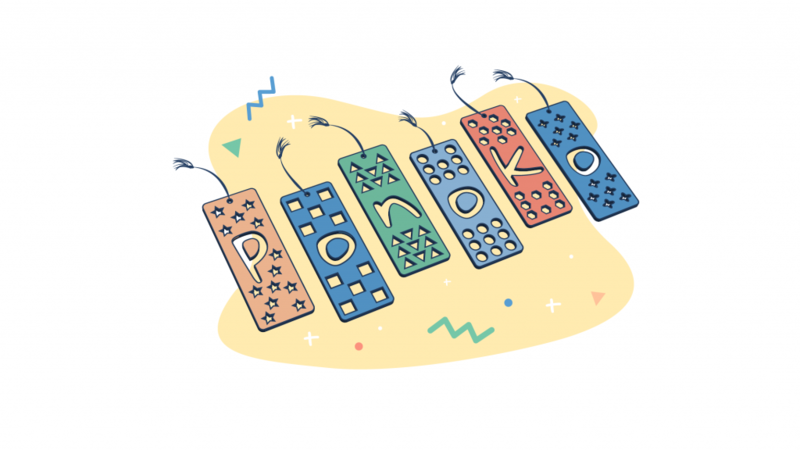 So when you’re making bookmarks to sell, check out the options so you can make an educated decision on which site is the best fit for your particular products. 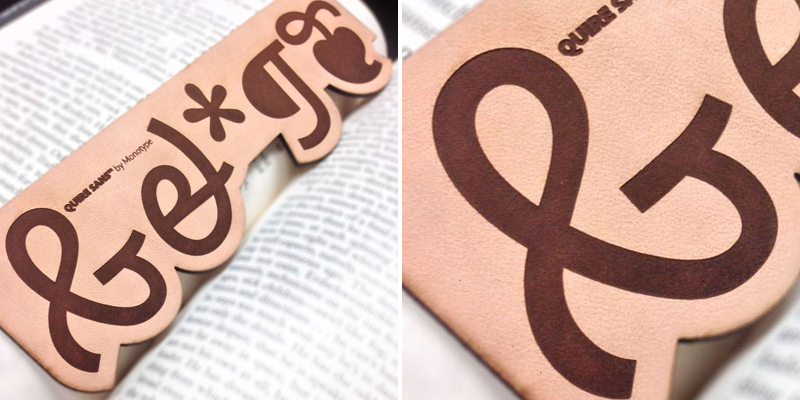 Initially you could print your own bookmarks at home. But if you want a luxurious finish, professional quality and larger quantity, then selecting a printing company to make bookmarks will be the most cost effective choice. You can get them printed with online services such as Smart Press and Vistaprint, retailers such as Staples and The UPS Store, a promotional products consultant or your local print shop. When working with harder materials such as wood or metal, you may need to invest in tools and or machinery in order to make bookmarks in bulk with consistency. For most makers, selling bookmarks will be a side hustle, so investing in machinery may be cost prohibitive. But there are online laser cutting services to the rescue! 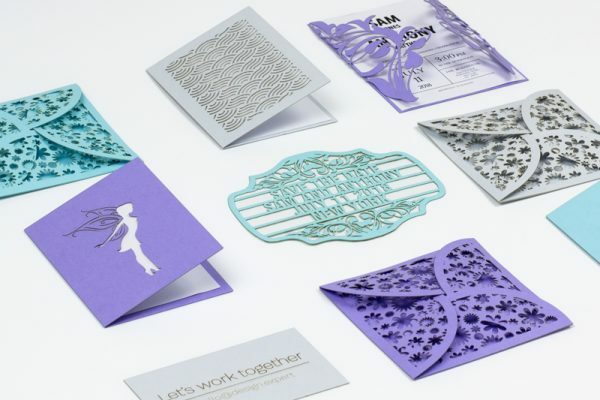 By making laser cut bookmarks through one of these services, you can have an ongoing supply that has consistent quality buyers expect. 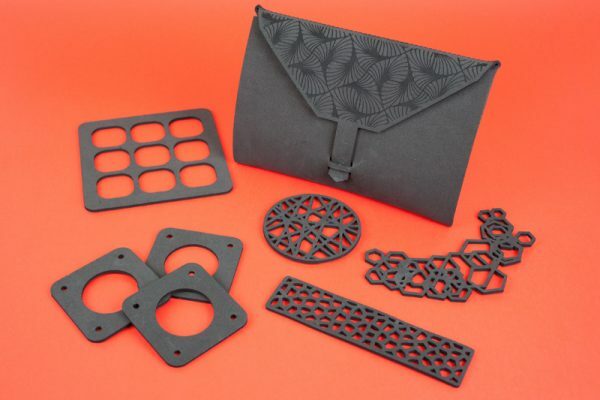 This method of production is an easy path to volume plus you can rely on the precision of a laser cut product to be consistent over time. To help get you started, we created three design files that you can play with to either use as a foundation to create your own design or simply use as is. 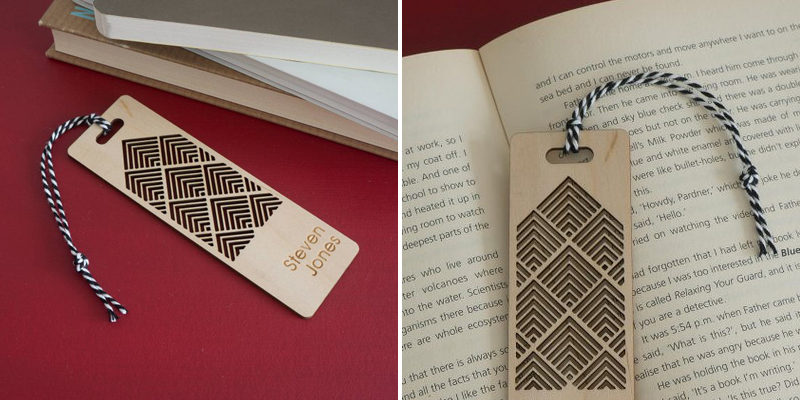 The first is a straightforward laser engraved text-only bookmark. We’ve used “Handy Dandy Bookmark” as the copy, but you can use any words or phrases that are meaningful to your buyers. “Read. Wine. Repeat.” anyone? If you’d like the laser cutting files for this design, download them here. One consideration when selling bookmarks is having unity between material and design. With this bamboo bookmark, we chose an abstract nature pattern to tie into the natural wood tones. Are they flowers? Palm leaves? Something else? We’ll let you decide. If making this kind of organic pattern comes natural to you, download the files here. Finally, geometric patterns look great with laser cutting, so we created this coral-inspired design to showcase just how awesome an abstract configuration can look. That said, strict straight-line shapes would look equally as nice. And you could even incorporate logos into the design for promotional purposes. If you’d like to make bookmarks like these, get a copy of the files here. All the above files were made in Adobe Illustrator, so that’s the best software to use if you want to edit into your own creations. Have fun! “A book is a device to ignite the imagination,” wrote Alan Bennett in the novella The Uncommon Reader. 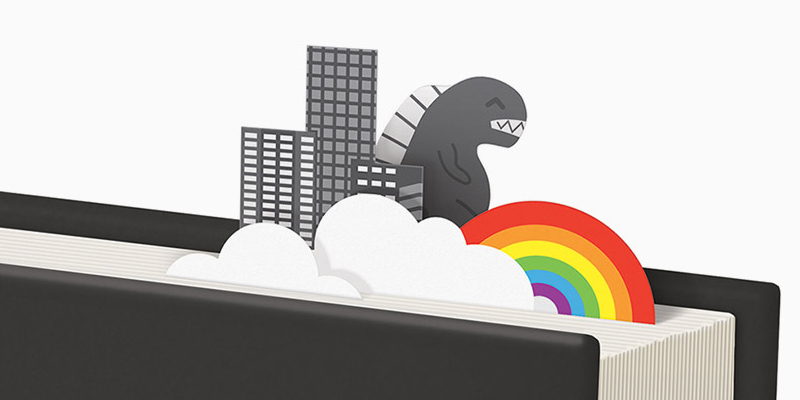 Shouldn’t bookmarks be creative and interesting enough to spark the imagination, too? Check out these 50 ways to make bookmarks on Tip Nut plus these 25 bookmark projects on DIYs.com. And, of course, there’s always more on Pinterest! 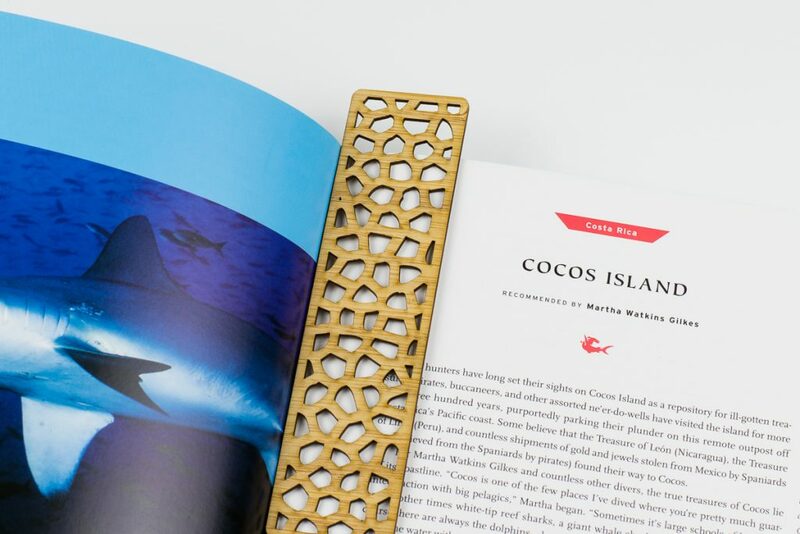 May you—and your customers—always have a great book in hand…and an equally great bookmark to keep your place.